Their cute kitty creation will be purrrfect for every cat nap! 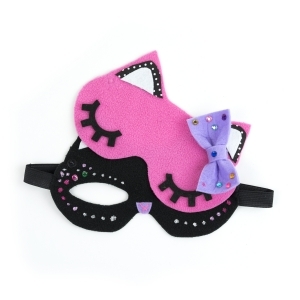 Design, create, and decorate 2 cat eye masks with dazzling rhinestones, glitter, and faux lashes. Beauty sleep never looked so good. This Kit Includes: 2 Cat nap masks, Fabric elastic band, Rhinestones, Glitter glue, Felt eyelashes, Cotton fabric, Colourful felt, Sewing needles, Thread, Sewable snaps and Instructions. Recommended for ages 7+ years.